As I previously mentioned, my dog is completely ball obsessed. What I haven’t mentioned yet is that she’s also water obsessed. Lab much? 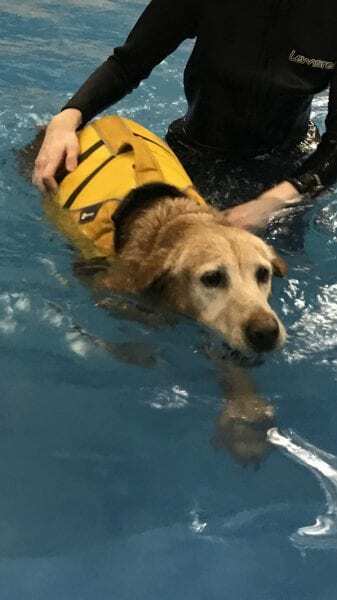 This dog has swum in rivers, lakes, and even the Pacific Ocean. Big waves, don’t care. I’ve never seen a dog swim as well as her and have never seen her as happy as she is when she’s fetching in the water. After she was diagnosed with osteosarcoma in February, it at some point hit me…. I really just wanted her to be able to swim at least one more time. I was telling a friend that I hoped she would be alive and well enough to take her swimming when it got warm enough to go. The friend mentioned there may be a way around this, and….enter the puppy pool. 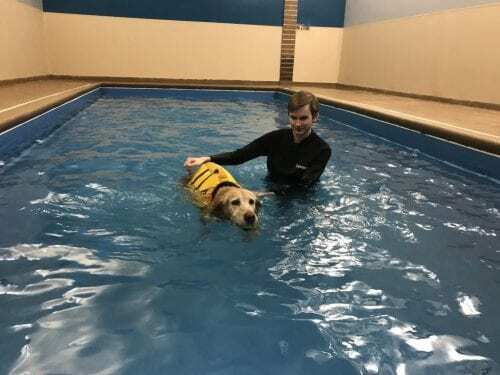 This is a place about half hour from me where you can take your dog indoor swimming. I had a day off coming up where I could take her and I went crazy making it happen. I was upfront with the staff about her condition and why we were there. They were super understanding and protective – possibly even a bit too hovering, but I honestly did appreciate their commitment to making sure Ruby stayed safe. Overall they were amazing. She hadn’t been on the pain meds for long and so she was a little bit drug-groggy on the day. They insisted she wear the life vest (oh the in-dog-nity!). I was afraid she would have none of the vest and be really irritated by it but she honestly couldn’t care less once we put it on her. We basically spent the next half hour playing fetch across the pool. I wore some wellies and quick dry pants and stayed at the end of the pool throwing the ball to Ruby and, when she brought it back, trying to convince her to give it back to me 😂. She had a blast! The employee guy stayed with her and made sure she didn’t come on and off the steps too hard. When I grabbed the ball, she would give me that “just throw it already” look. And for that half hour, she just swam around contentedly chasing that ball. Im hoping I can take her again sometime soon – work schedule makes it hard, but I’m looking for an opportunity. I’m so glad and thankful I got to take her at least that once. Ruby is a very lucky gal to have such a wonderful hooman who is willing to do whatever it takes to make everyday RUBY DAY!!! Can’t wait to hear about her next adventure. Maybe a Starbucks Puppacino?? Smooches to Riby and ear scratches to Pandora. Awe so sweet you got Ruby to the water and what a wonderful place you found to have some caring people too! I agree I bet you find a way to get to the pool again there or some water elsewhere. When there is a will there is a way! More water and ball throwing Miss Ruby! Puppucinno’s too of course! Scratches and smooches to both Pandora and Ruby, please! Pkitty Catnanigans is brought to you by Tripawds.